The Hotel Doherty is 90. 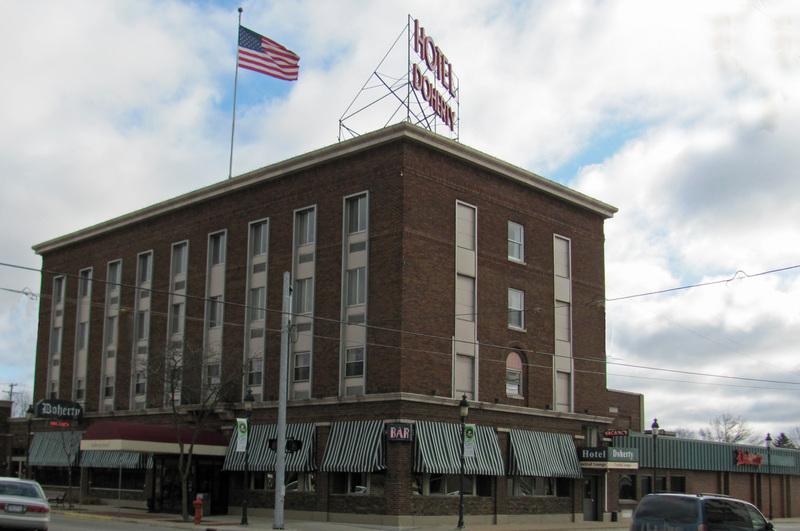 It opened in early April 1924 and was as modern for its time as a hotel could be, as the article below from the April 11 issue of The Clare Sentinel testifies. The Doherty sits on the NE corner of McEwan and Fifth in the city of Clare and the hotel keeps up with the times and demand but with an eye on its past. The Doherty recently added a banquet hall and outdoor dining area but had a brick especially made to match the brick in the original 1924 exterior. The Doherty is also home to a bunch (or is it a tribe, flock, gaggle or herd) of Leprechauns. Sometime during the Depression, an unknown painter made a deal with the owner or hotel manager to create a painting in the hotel bar in return for a free room. The painting, which is about 70 feet long and approximately three-feet high covers the upper portion of two full walls in the bar/restaurant and depicts the beer making process from harvesting the base materials to the drinking. The brewmasters are the little green creatures—probably used in keeping with the Irish character of the city that was named after County Clare in Ireland. A.J. 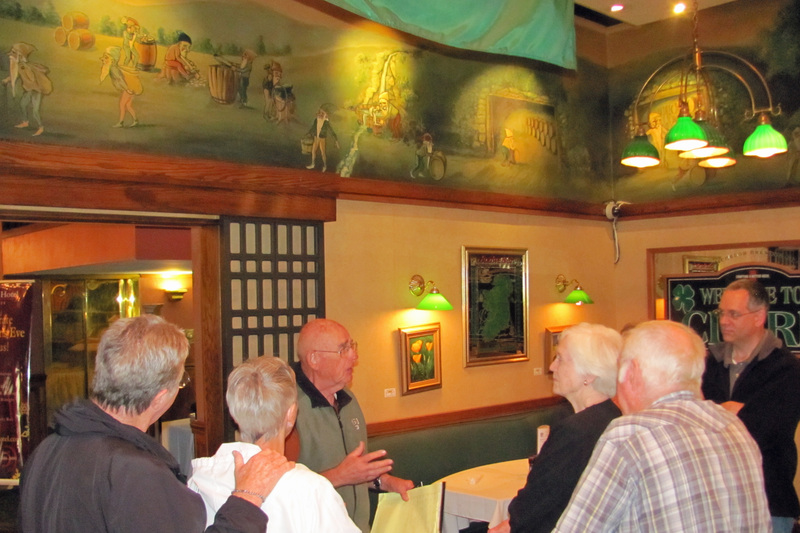 Doherty, son of the founder, talks about the painting of the laprechauns during a Depression Era art tour in 2012. The leprechauns also were silent witnesses to one of the most famous murders in the state when Jack Livingstone shot Isaiah Leebove in cold blood in the restaurant in 1938. The murder is the topic of a new book by Robert Knapp called “Mystery Man, Gangsters, Oil, and Murder in Michigan. Knapp is also the author of a history of the city of Clare, which contains a number of photos of the Doherty. The Doherty was built by A. J. Doherty, a local businessman and politician that had the best interests of the city in all he did. Even now, the hotel remains in Doherty hands, being run by Dean Doherty, grandson of the founder. Although always popular, the Doherty was used by local businessmen in the first half of the 20th century, not only because of its location and quality, but because it had something few buildings in the area had at the time: a telephone. 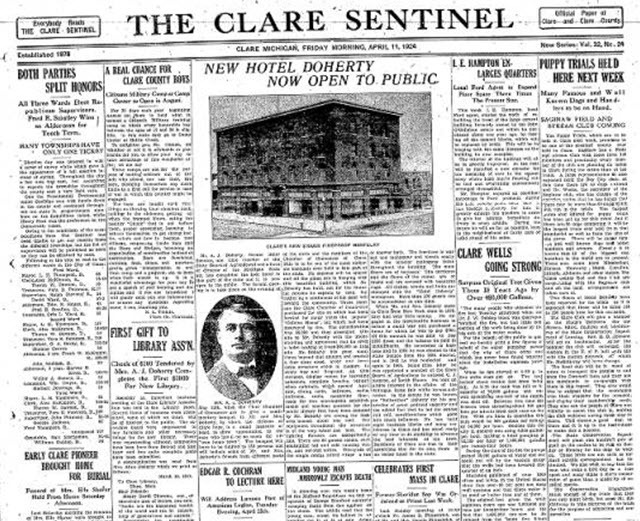 Front Page of The Clare Sentinel announcing the opening of the new hotel in Clare. The banquet will have to be limited to 150 persons and will include some of Mr. and Mrs. Doherty’s friends from different parts the state and the members of the Chamber of Commerce of Clare. This is to be one of the most elaborate banquets ever held in this part of the state. No expense will be spared and all the plans are in keeping with this beautiful building which Mr. Doherty has built, not for the financial returns he expects to reap, but rather as a testimonial of his good will toward the community. Mr. Doherty has gone many times beyond that amount and erected a four-story steel, brick and terra cotta structure which is modern in every way and fireproof. 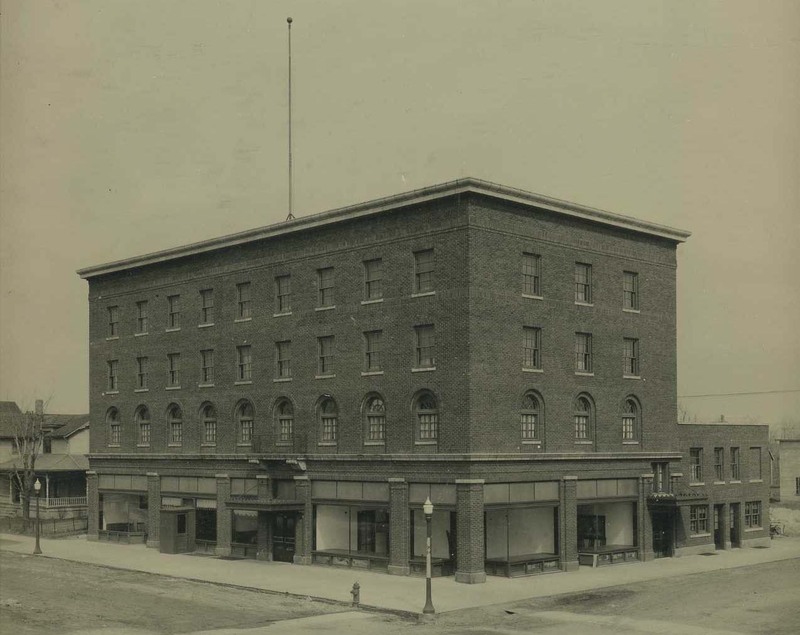 An Otis elevator, display rooms for traveling salesmen, complete laundry, billiard room cafeteria, which opened April first, dining room, ballroom, radio, ballroom, radio, mezzanine floor, room for two mercantile establishments and spacious quarters for the public library that have been donated by Mr. Doherty, are among the features housed under one roof. The equipment throughout the structure are the latest and the best. The lighting fixtures are exceptionally tine. There are 60 guests rooms, each containing hot and cold running water, and several suites. Thirty-six of the single rooms afford either a tub or shower bath. The furniture is walnut and mahogany and blends neatly with the interior’s mahogany finish throughout the building. The main floors are of terrazzo. The corridors and the floors of the rooms are of _______and are covered with beautiful rugs. All dishes, towels and linen are stamped with the “Hotel Doherty” monogram. More than 100 guests can be accommodated at one time. When Mr. and Mrs. Doherty came to Clare from New York State in 1878, they had very little money. He engaged in the mercantile business in rather a small way and purchased a home for which he was to pay $750. Of this amount he was able to pay $250 down and the balance he paid in installments. He succeeded in business and in 1901 he was elected to the State Senate from the 28th district, and in 1903 he was re-elected and again in 1905. Sometime later he was appointed a member of the State Board of Agriculture to succeed C. J. Monroe, of South Haven. He took an active interest in the affairs of the Michigan State Fair while he was a director. In the senate he was known as “Bellwether” Doherty for his possession of great political sagacity and the added fact that he led the senate roll call, considerations which gave him much influence. He has built eight business blocks and many residences in Clare and has stood ready at any time to do anything to advance the best interests of his town. Residents of Clare are free in their assertions that for its size, there is no better hotel in the state.